support services that a CFO has traditionally been responsible for. The current task field of Finance & Controlling differs in many respects from the supporting services for which a CFO traditionally has been responsible. Broadness and depth of the topics a CFO must master today have obviously increased. The process regarding transformation of Finance & Controlling functions has been put in motion. Now it is necessary for each company to determine the own position in this development process and to take the required measures for a further development of the F&C area. In the external and internal accounting, the range of services extends over all aspects of the financial and investment accounting, controlling and consolidation. Special focus is on the group accounting. 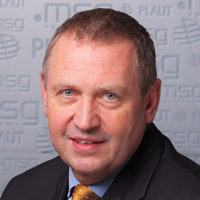 Through the usage of highly modern information and communication techniques Plaut ensures a completely coordinated legal and management consolidation on all relevant reporting areas. The integration of additional control parameters ensures that managerial decisions can be made respectively market-, customer- and success-oriented. as well as a reduction of the reaction and decision periods. Simplification is the strategic answer to present and future challenges. With the fourth-generation Business Suite, S/4 HANA, SAP provides a solution that makes the digital world easier. S/4 HANA Finance is one of the first building blocks based on the advanced in-memory platform SAP HANA and equipped with the device-independent and user-friendly interface SAP Fiori. Plaut S/4 HANA Finance Assessment is a three-level consulting service that can be accessed individually or in combination. S/4 HANA Finance Informer shows the product innovations and potential uses and deals with the technical requirements (e.g. Plaut HANA Quick Check) as well as the different operating models. S/4 HANA Finance Value Assessment uses a functional analysis to show the effects on customer-specific business processes and summarizes them in a business case. S/4 HANA Finance Roadmap offers the creation of a transformation strategy and a derived roadmap for achieving the goals. The open global capital markets increase the influence of external stakeholders. Investors and analysts demand that corporate data be made available at ever shorter time intervals. In addition to the actual data, plan data is often required. This leads to an excess of forecasts and emphasis. It is not enough to provide the results of the companies and the Group. The results for individual segments have to be determined. You need controllers that work proactively and provide an outlook on the future development of the business. The focus is on decision support for management and external stakeholders. In order to meet the demands of globalization, existing instruments need to be adapted and new tools developed. What is needed are instruments that can be implemented quickly and easily, and that require only a minimum amount of maintenance in the permanent application. 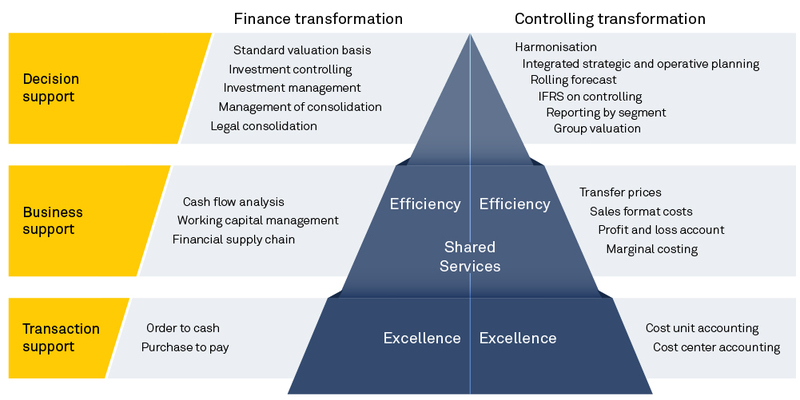 In every phase of an enterprise and in every phase of the economic cycle, the classical flexible cost accounting is the basis, as here the cost centre accounting, the cost unit accounting, the profitability analysis allows statements regarding overheads, costs of goods and contribution margin accounting. A company, that does not know its lowest price limit, cannot persist in today’s market. Also, statements regarding the overheads area, absolute and proportional, are common benchmarks today and – if optimally lined up – a clear competitive advantage. A qualitative allocation of these overheads to the products will show the coverage contributed by the products and thus will calculate the planned level of activity. This is the only way to make the right decisions that are necessary to manage an enterprise, via deviations in the level of activity, the consumption (quantity and price) and a possible deviation in structure. Plaut has developed and implemented the cost allocation and steering models of the respective business models for more than 60 years. With this experience, the industry-specific influences and necessities have grown accordingly, and can be beneficially deployed in projects today. Since enterprises have started to get more and more involved in international markets and have simultaneously come into the focus of interested third parties like banks and analysts, the classic fields of activity have gone through a profound change and expansion. The CFO has become the most important counterpart of the CEO and the decision makers in the operative units. Today’s CFOs are characterised by a new conception of themselves. The model against which leading CFOs let (want) themselves to be measured, is to guarantee a maximum of efficiency and effectiveness in mastering their tasks and thus contribute substantially to the increase of the corporate value. Orientation of the costs of finance and controlling towards the international standard (see figure 2). Safeguarding and preservation of the financial substance and the capital, abiding compliance-requirements and risk management. Constant readiness for discussion about the strategic orientation of the enterprise and identification of possible acquisitions to safeguard the market. Professional poise opposite equity owners and analyses: Focussed communication to support target achievement. This transformation usually takes place in this environment and was experienced by Plaut in many projects. The cost pressure on the service area finance increases steadily and will further intensify in the next years, since it is expected that the functional area finance contributes to the value added for the enterprise. For Plaut, especially the process tasks are in the foreground. The aim is to develop the complete financial supply chain into a coordinated optimum. The cost reduction measures realised up till now were focussed on the IT. Meanwhile, there is a time pressure to also put an emphasis on measures for process costs. Often, there is a lack of confidence in the measures taken for safeguarding the financial situation and the future liquidity. The planning tools are out of date and not efficient enough. In an environment that is subject to rapid changes, it is not a voluntary exercise but a necessity to handle the tools of the finance functions portfolio well and to realise them in a cost-efficient way.